Love stories are a lot of fun when they involve people you know. This month, ask your students to interview a couple that they know. They should interview one person at a time using the same four questions (provided below). After the interview, they can practice using the simple past tense to retell the love story to their classmates. Which couple had the best love story? 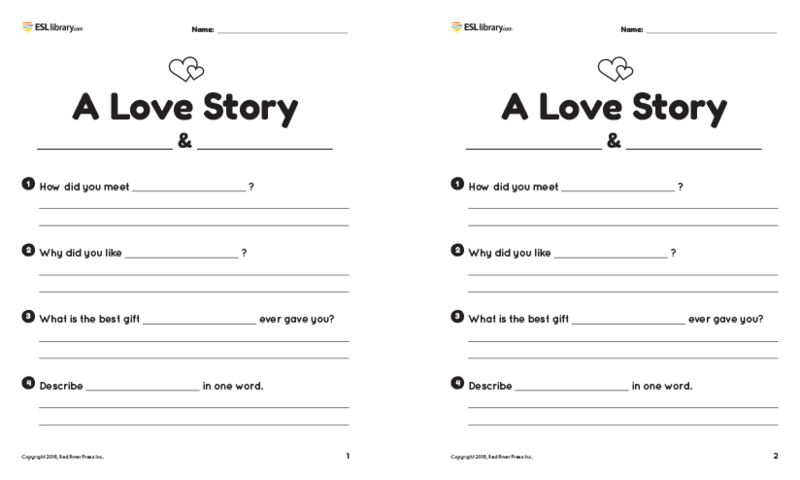 Print a two-page copy of the Love Interview for each student. The pages are identical so that students can interview the two people separately. They should ask each person the following four questions. How did you meet (sweetheart)? Why did you like (sweetheart)? What’s the best gift (sweetheart) ever gave you? Describe (sweetheart) in one word. Have your students report their findings to a classmate or the whole class as a Valentine’s Day activity. My grandparents met at a grocery store. My grandpa liked my grandma’s long hair. My grandma liked my grandpa’s sense of humor. The best gift my grandma received was an engagement ring. The best gift my grandpa received was a subscription to a car magazine. The word my grandpa used to describe my grandma was genius. The word my grandma used to describe my grandpa was joker. Optional Activity: Fact or Fiction? Older or more advanced learners might have fun mixing this activity up a little. During the sharing time, tell your students they can change the answers if they want to. Some of the answers can be true, and some can be made up. My students love fooling their friends—don’t yours? My grandparents met at the Olympic Games. Really? Why did your grandpa like your grandma? My grandpa liked my grandma because she was a good cook. You do? I fooled you. My grandma is a terrible cook! My grandpa liked my grandma because she wore a pretty dress. The interview couple might also like to see each other’s answers. Encourage your students to share the answers out loud with the couple too. Grandpa said you met at a grocery store. Grandma said she liked your sense of humor. PS. I hope you’ll come back and share a love story with us in the comments! This is an amazing activity! Thank you for sharing.